The creation of lampwork beads is like a labour of love and an artpiece in itself. Lampworking is actually an ancient Greek art of creating glass beads. Each lampworked bead can consist of layers upon layers of glass, shaping colours to achieve desired effects and images. Lampwork beads is a variant of the wound glass bead making technique. Lampworking is very labor intensive. In the Venetian industry, where very large quantities of beads were produced in the 19th century for the African trade, the core of a decorated bead was produced from molten glass at furnace temperatures, a large-scale industrial process dominated by men. The delicate multicolored decoration was then added by people, mostly women, working at home using used an oil lamp or spirit lamp to re-heat the cores and the fine wisps of colored glass used to decorate them. These workers were paid on a piecework basis for the resulting lampworked beads. Modern lampwork beads are made by using a gas torch to heat a rod of glass and spinning the resulting thread around a metal rod covered in bead release. 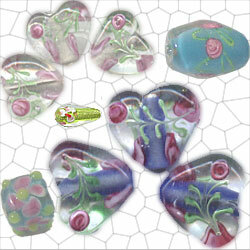 When the base bead has been formed, other colors of glass can be added to the surface to create many designs. After this initial stage of the beadmaking process, the bead can be further fired in a kiln to make it more durable. Modern beadmakers use single or duel fuel torches, so `flameworked' is replacing the older term. Unlike a metalworking torch, or burner as some people in the trade prefer to call them, a flameworking torch is usually "surface mix"; that is, the oxygen and fuel (typically propane, though natural gas is also common) is mixed after it comes out of the torch, resulting in a quieter tool and less dirty flame. Also unlike metalworking, the torch is fixed, and the bead and glass move in the flame. American torches are usually mounted at about a 45 degree angle, a result of scientific glassblowing heritage; Japanese torches are recessed, and have flames coming straight up, like a large bunsen burner; Czech production torches tend to be positioned nearly horizontally.